Scrapping School Sport Partnerships – ideology or idiocy? Of the many billions of pounds that the government have cut in their ideological zeal to shrink the state, few have met with the passion and unified outrage that have greeted the £162 million abolition of the School Sport Partnership grant. For readers of the right wing press it may come as a surprise to learn that competitive school sport has undergone a huge transformation for the better over the last few years. 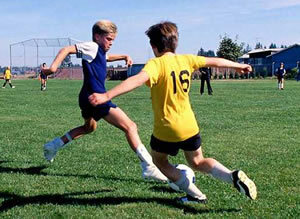 The Conservative orthodoxy was that Labour were anti competition and our schools full of callow or obese youths who would rather play on computer games than venture on to a sports field. Our school teachers were, the same version of history goes, well intentioned but naive sorts who would much rather have children doing dance or hopscotch than expose any child to the trauma of a sporting contest in which someone was deemed to have ‘won’ or ‘lost’. Meanwhile in the real world, hundreds of thousands of children have represented their schools in competitions up and down the land in a huge variety of sports. The School Sport Partnerships have brought coaching expertise that would never have been available to individual schools, particularly to primary schools, and set in place a network of talent identification that has the potential to provide a world class sporting legacy for the future. The success of Britain’s approach wasn’t just recognised here. In Australia, where they know a thing or two about developing world class sports people, the work of School Sport Partnerships was greatly admired. And it is hardly surprising; the number of children who represented their schools in sporting competition against other schools in 2009/10 is an impressive 49 per cent, up 14 per cent in four years. But even this figure belies the true extent of the success the programme enjoyed, because the overall figures are skewed by the reduction in school sport that occurs as year 11-13 children approach exams. In year six, 70 per cent of boys are involved in inter school competition against other schools and the percentage of children enjoying at least two hours of sport in school has risen from 25 per cent when Labour came to power to 95 per cent now. A host of leading sporting stars have risen up against the decision with Olympic sprint gold medallist Darren Campbell, badminton star Gail Emms and England goalkeeper David James amongst the chorus of disapproval. The government has adopted two strategies in the face of the clamour for them to back down, claiming simultaneously that nothing has changed and that the improvements in school sport so dramatically evidenced are somehow imaginary. Their suggestion that schools can retain School Sport Partnerships if they wish and fund them themselves is disingenuous. With growing dismay at the effect the ‘pupil premium’ is actually likely to have on deprived schools, the idea that schools will choose to prioritise school sport is risible – it was precisely this approach back in the 1980s that saw our school sport decline so drastically back then. Alongside claiming that the evidence given to support School Sport Partnerships is somehow an illusion, the government claim they want to instead spend a fraction of the money saved on a School Sport Olympics. Whilst in itself this is fine, there are two problems with this. Firstly they pretty much already exist; they are called the UK Sport Games and allow elite athletes to come through a series of local, county and regional competitions to compete in National finals. And secondly, you guessed it, they rely heavily on the network of School Sport Partnerships to run the initial qualifying events and provide the coaching to identify the talent in the first place. Sadly this policy decision seems typical of many being made by the government. It starts with a false assertion, in this case that school sport is in decline. Once the false assertion has taken root, it is followed by the conclusion that an abolition of current systems will improve things. In turn the belief in ‘localism’ then leads to the end of collaborative working, in favour of everyone looking after themselves. Bizarrely in this case, following the new Tory dogma will not only destroy the public sector network that would have enabled the government to deliver their school Olympics, but it will also abandon thousands of school sport ‘ambassadors’, an army of volunteer sports coaches trained up at secondary schools who deliver the primary school curriculum – the very embodiment of the Big Society, you would think. So surely the Conservative government’s ideological drive for a more localised and competitive Britain has many unintended victims and a broad range of critics: from Olympic stars to head teachers in some of our most deprived schools, from an army of volunteer helpers to the flagship school Olympics – this isn’t ideology it’s idiocy. This is government by those whose first choice of daily paper is the Daily Mail. They’ve been making sweeping and grossly misleading statements about state education for years. On the general policy on sport since the Coalition came to office, Jeremy Hunt said in a newspaper over the summer that he wasn’t sure what the olimpic legacy was. Well lets have a look at what’s happened since this government came to office, shal we? In addition to what we’re talking about here, free swimming has been scrapped, the revamp of sports facilities under BSF has been scrapped, and a decision on the so called ‘Crown Jewels’ has been put off until I think 2014. The latter is important because, if sport is not available on television to a majority of the population, our youngsters will not be enspired. And since we’re on localism, although off subject, why has it taken Michael Gove so long to realise that his reforms to funding run contrary to localism? Swimming was never free. It always costs someone something (buildings, heating, lifeguards). The questions is, who should pay? The swimmee or the rest of society? ‘Janie_s’ if we make swimming and other sporting activities unaffordable for people that is in noone’s interest. Everything is ideology for Gove – evidence doesn’t really play a part.